John Wilcox Competition Engines have a long association with the new Triumph motorcycles, working closely with Triumphs Design Department on both current and future engines. The picture to the left is a T595 undergoing rigorous endurance testing on our own, state of the art £200,000 dyno test cell. This is the ONLY way to quote TRUE BHP figures, produce correct fuel and ignition maps and develop engines. 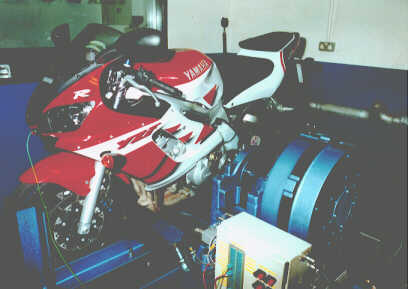 For some purposes it is not cost effective to remove the engine from the bike for dyno testing Most people use rolling road type dyno's to test the power output from their engine. It is not possible to accurately convert the power at the wheel to the power at the crank. We have come up with a soloution to provide very accurate power figures at the crank. The whole bike is clamped in a frame which adjusts and couples the dyno directly to the output shaft on the engine. Having developed engines for Triumph for more than 12 years, we have built up a vast range of data giving us every advantage when it comes to tuning these engines for more performance. During recent years we have carried out the power development work on the TT600 and the 147 PS Daytona. During the development of an engine, we are able to see how an engine responds to various changes to head modifications, cams & cam timing, exhaust and inlet modifications. We are then in an ideal position to offer performance upgrade kits based on true power improvements and not just bolt on 'shiny bits'.